Situated on the 6th floor of a recently constructed luxury holiday complex in central Patong, this stunning two bedroom apartment has great views of the mountains, the town and the large pool. It is fully furnished and air-conditioned, with all facilities such as cable TV (80 channels) and DVD, free WiFi, safe box, 24 h security, free car and motorbike parking in the garage. There is an on-site coin operated laundry and fully equipped gym. Great privacy as there are no tall buildings nearby that overlook the south-facing balcony from which there are great sunset views. Our friendly and helpful team on site, will attend to any of your questions and needs. 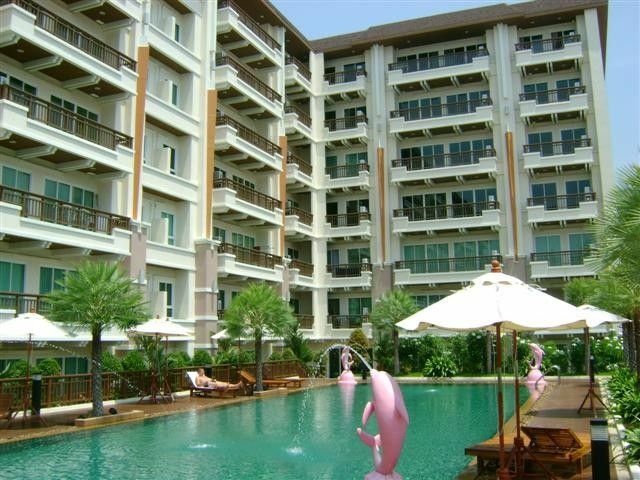 Phuket activities: Across the road from the apartment you will find many travel booking agents that will assist you in making arrangements for a multitude of enticing activities all around Phuket. Many of these will pick you up at your doorstep and return you home as well. Great cultural attractions include the Fantasea Theme Park and Simon's Cabaret. Of course you can arrange boat tours to nearby reefs and islands to snorkel or dive. Other possibilities for sporty entertainment include go-karting, elephant riding, horse riding and zip-lining. Smoking allowed on the balcony, not indoors. We stayed at Frank’s condo from December to March 2019. The condo is well located, 2 blocks/ approx. 10 min. walk from the beach via Soi Sansabai Rd & Bangla Rd. Lots of restaurants and shops in the vicinity. Jungceylon Mall with huge Big C supermarket and Banzaan Market for fruit & veg. all within a few minutes’ walk. The condo is in good condition from the exterior all units with large balconies.The spacious entrance area is furnished & nicely tiled. There is a management office, a small convenience shop & a travel agency as well as a bookcase with guests recycled books. Building doors are operated by keycard. There are two elevators at the front and one at the back by the gym. Laundry facilities are in the basement. Washers are 30 baht for 11kg machine,60 baht for XL machine. Dryers 20baht/10mins & need at least 80baht to dry. You can have laundry done anywhere for 50baht/KG. The condo was spacious however describing as a “luxury” condo is a stretch. Furniture needs upgrading in the living room as well as the bedroom mattresses. It definitely gave the impression of a holiday let, not a luxury condo. Beds were made but additional linens were not matching. OK for short stay, not so good longer. All rooms have their own programmable aircon. Layout is good for privacy, 2 bedrooms separated by living room. Both have ensuites, one with full bathtub/shower, other with walk in shower. Hot water was sporadic in the shower. Kitchen was small but functional. Enough dishes, glasses, cutlery, utensils for 4. Microwave, 2 burner hotplate, toaster all worked well. Toshiba 2 door fridge/freezer kept everything super cold. 2 TV’s but only living room one worked. There were a few channels in varying languages, 2 movie & 2 news channels in English. We did not try the DVD. Not enough towels for a longstay; 2 white & 2 brown bath towels + 2 beach towels. There was a basic supply of liquid soap, toilet tissue and cleaning supplies in the condo. The pool opens at 9am, limited lounge chairs, maybe 10, which were usually occupied by 11am. Hard plastic with no pads, & very uncomfortable! No food or drinks allowed but we did take bottled water with no issues. Frank was a good host and replied to emails quickly. We had a few issues. He resolved what he could quickly & apologized for what could not be attended to while we were there. The unit itself has potential but is definitely tired. The apartment was very nice and stocked with all that a person needs for a short stay. Property sit in a great location right between the Marriott and APK hotels, which makes it very easy to find. Very close to everything, just cross the street immediately in front of the driveways, turn left, go to the corner and turn right and you are on the very popular Soi Sansabai. Travel Soi Sansabai to the end, cross the street and you are now entering Bangla Road. Great area, my sisters really enjoyed their shopping experience there. Miss Jenny and Miss Sue were very helpful and attentive to whatever needs my sisters and I had. It was overall a really great experience. Apartment is as described. Clean, no bugs, excellent location yet quiet. It would have been nice to have more towels, and more utensils. The pool is great but doesn’t have many chairs. Frank was really nice to deal with. Pleasant experience. Thank you! And the most important thing is the owner "Frank" who is completely responsive and very nice. He replied us so fast and arranged our late check in very comfortable. I do appreciate Frank for everything. Great place to stay and lovely apartment. The location suited us perfect as it was a few minutes walk to Jung Cheylong and our favorite place for dinner The Irish Times. We stayed in this unit recently and were very impressed, the unit is exactly as pictured, very modern, neat, clean. It has everything you could need during your stay with a well appointed kitchen that has a full sized fridge/freezer, two large spacious bedrooms, lovely comfy lounge and two bathrooms. The unit location is fantastic, a few minutes walk from the shopping center and Banzeen markets and about 5 mins walk to Bangla Road and beach. Frank was very helpful from the very first email, we were, at first, a little worried about booking direct and sending money overseas, but these concerns were not necessary as everything turned out perfect. Frank responded to all our emails promptly and continued to offer assistance while we were on holidays. Will be staying again next visit for sure. Phuket, the pearl of the Andaman sea, is a tropical paradise with great sandy beaches and lush tropical scenery. Phuket Villa is located in the heart of Patong, which is one of the most popular tourist places on the island of Phuket in Southern Thailand. The town of Patong is wellknown for its wide selection of restaurants, bars and other entertainment. In addition there is a large shopping mall, Jungceylon which in addition to a Carrefour supermarket and Robinson department store, also holds an excellent cinema. Nearby the complex is a wide variety of restaurants serving dishes from all over the globe. If you are enticed by the great local seafood, there is a market just near where you can buy all exotic seafood and those great Thai spices, vegetables and fruits to prepare your own meal in our fully equipped kitchen. A few minutes walk brings you to one of the best beaches of Phuket or to the best entertainment area. For less than one month, security deposit is one week rental. For one month and up, the security deposit is one month rental. Including utilities, but excluding cleaning services. Cleaning services can be arranged with reception at desired frequency.